Jim, I have a present for you. Think of it as a key to a long-lost secret. This is the geometric definition of the inch. It is 1/2 of a circle in terms of the short leg of its Kepler Triangle. The Kepler Triangle is the core triangle which defines Khufu Akhet. It is all you need besides the scale factor to design this pyramid. Even more simply, you only need the short leg and the height which defines the seqed. You don't even need the side-slope. It follows by necessity. Now, do you remember 2160....of course you do. You brought it up. It is 1/10 of a circle in degrees written in arc-minutes. The Earth-Moon orbital system can be modeled with a square-inscribed circle. The circle caps' surface area is 0.2146 of the square. What is the circumference of the Moon (6786 miles) in the metric system? 10,919,000 meters. How do we measure circumferences? We use angular units...degrees, nautical miles, etc. But what about just using a geometric unit....1/2 circle (which relates to a linear system as I show above). Then, we can say to go around the Moon we travel 5,459,500 meters twice and meters here are a curvi-linear metric because we are on a circle. But what does that mean in the corresponding linear system to which the inch is married? It means: 5,459,500/2.54 = 2,147,991 x Kepler ▲ short legs. And that is 10,000,000 sets of circle caps (0.2148) in an inscribed circle. So....let's apply this to the G.P. What do we get when we multiply 220 rc by 2.54? We get 559. David will recognize that number. What do we get when we multiply 440 rc by 2.54? We get 1/100 of geodetic degree in kilometers. What do we get when we multiply 1760 (GP perimeter) rc by 2.541? We get 4472 rc, which is the distance in cubits of the G.P. 's north edge to the 30th parallel. And that difference (~75 arc-seconds short of 30 degrees) is proportional to the difference light would fall short of 7½ circum-global revolutions in one second. 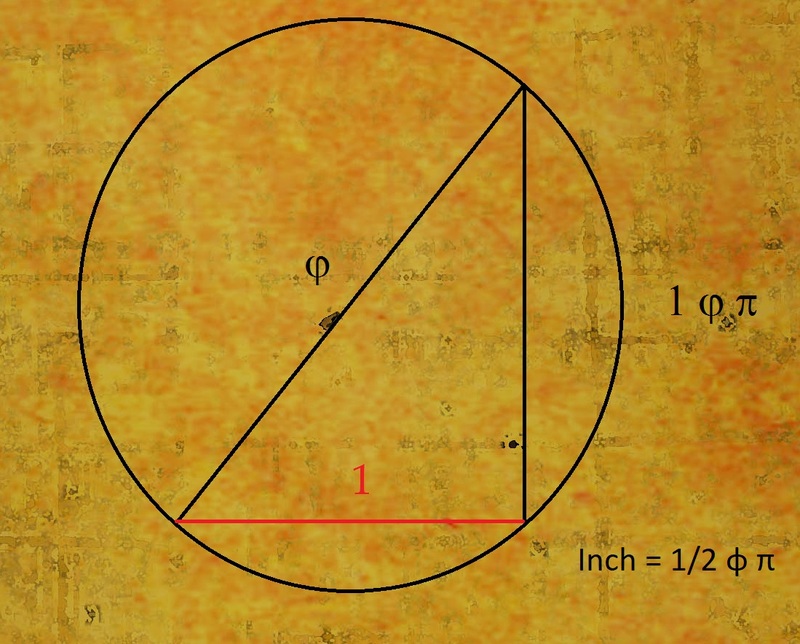 The inch is the numerical gateway to geodesy. How can we (should we) interpret this? Edited 1 time(s). Last edit at 18-Mar-18 16:42 by Manu.